Have You Eaten At Chennai’s Most Iconic Pakoda Shop Yet? 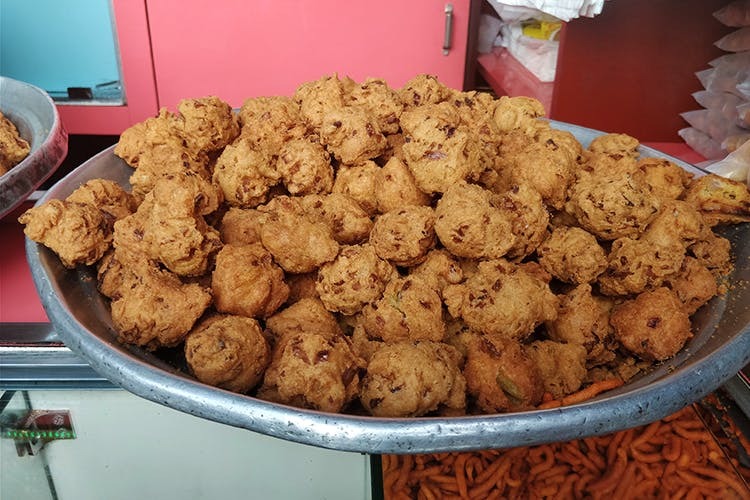 Sri Karpagambal Kabali Sweet Stall is super famous for its onion and mint pakodas and people have been enjoying these munchies for the past 42 years. Expect to see a bunch of people lined up right outside Sri Karpagambal Kabali Sweet Stall at 6pm every day to buy their fresh snacks. Located on Mathala Narayanan Street, this stall is a must-try if you love samosas, pakodas, and other savouries. This stall is known for their tiny, round and crispy onion samosas, filled with deep-fried caramelized onions. They also have pudina (mint) samosas that make for a refreshing snack. However, it is the onion pakoda which is the show-stopper at this stall. For INR 30, you get 200 grams of onion pakoda which explains the long line standing outside the stall. The best things about these pakodas are that they don't leave annoying traces of oil on your fingers! They have bondas, thattai, banana chips, omapudi, mixture, karasev, and sweets like jangri and ladoo. Make sure you park your car someplace and walk to this stall as the street is very narrow. And if you’re going there for the onion pakodas, get there by 6pm, that’s when all the magic begins!